There are two things everyone loves: cute things and explosions. Well, I like cute things and explosions anyway. 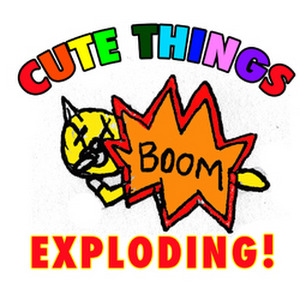 That’s where the brilliant new website Cute Things Exploding comes in. They take your favorite viral videos and have them all end with something adorable blowing to smithereens. While YesButNoButYes describes the site as “designed by a 10 year-old hopped up on Flintstone’s vitamins and Jolt Cola,”that doesn’t make it any less awesome in design. For example, take the adorable surprised kitten video, as filtered through Cute Things Exploding’s lens of evil. It’s oh so wrong, yet oh so right. They just apply a pretty lame fire effect to the end of the adorable video, add in some sound effects, and you’ve got comedy gold right there, in a flaming pile on your lap. Viral videos don’t get much better than that, even if they involve pants on the ground.